Upperside is brown-black. Forewing has few clear dots and very dim markings; patch at end of cell is grayish. 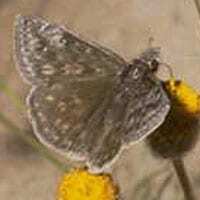 Male forewing has many raised white hairs. Hindwing fringes are dark. Male has a costal fold containing yellow scent scales; female has a patch of scent scales on the 7th abdominal segment.